FITNESS & WELLNESS PART TWO 90 REGISTER ONLINE: classweb.townofcary.org Barre Ballet Barre Workout (age 16 & up) ☯ This class is a basic ballet barre workout, but with a twist! Be ready to develop graceful ballet muscles with every move. Perform stretches and self-body resistance exercises to sculpt your inner ballerina. Fun for all levels! Wear loose-fitting clothes. Ballet slippers optional. Location: Bond Park Community Center Instructor: Maggie Witter Fees: $44(R) $56(N) (4 classes) 110700 Sat Jan 13–Feb 3 3–4 p.m. 110701 Sat Feb 10–Mar 17 3–4 p.m. (no class Feb 17, Mar 3) Boxing Fitness Boxing (age 18 & up) This high-intensity interval workout will leave you feeling sweaty and empowered! Use a variety of boxing methods (mitt work, heavy bag combinations, jump rope, bodyweight circuits, shadow boxing, and more) to burn calories, increase muscular and core strength, and elevate your cardio endurance. There's no better stress reliever than punching a heavy bag or mitts! All fitness levels welcome. Location: Middle Creek Community Center Instructor: Michelle Chopp Fees: $45(R) $63(N) (9 classes) 111077 Mon, Wed Jan 8–Feb 7 6–7 p.m. (no class Jan 15) Fees: $50(R) $70(N) (10 classes) 111078 Mon, Wed Feb 12–Mar 14 6–7 p.m. 111079 Mon, Wed Mar 19–Apr 25 6–7 p.m. (no class Apr 2, 4 & 9) (Apr 9 class will be held Fri, Apr 13) Fees: $45(R) $63(N) (9 classes) 111080 Mon, Wed Apr 30–May 30 6–7 p.m. NEW! Total Body Conditioning (age 16 & up) Join us for an invigorating, time-efficient workout that focuses on conditioning, strengthening, and toning. Body bars and weights will be used. 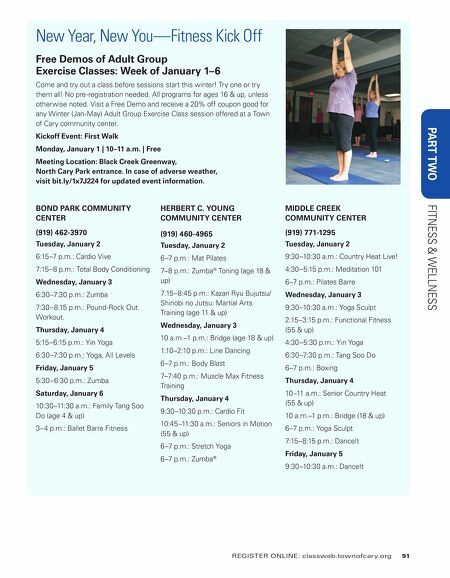 Location: Bond Park Community Center Instructor: Laura Gnewuch Fees: $80(R) $110(N) (16 classes) 111001 Tue, Thu Jan 9–Mar 1 7:15–8 p.m. Fees: $60(R) $84(N) (12 classes) 111002 Tue, Thu Mar 6–Apr 12 7:15–8 p.m. 111004 Tue, Thu Apr 17–May 24 7:15–8 p.m. Pound—Rockout. Workout. (age 16 & up) Channel your inner rock star with this full-body cardio jam session inspired by the infectious, sweat- dripping fun of playing the drums. Using Ripstix (lightly weighted exercise drumsticks), you will torch calories and drum your way to a leaner, slimmer physique—all while rocking out to your favorite music! 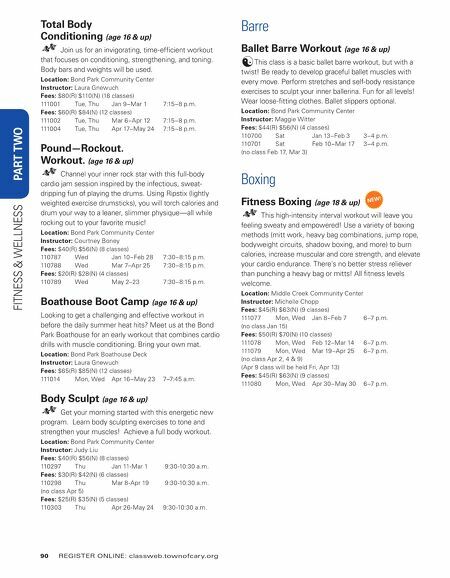 Location: Bond Park Community Center Instructor: Courtney Boney Fees: $40(R) $56(N) (8 classes) 110787 Wed Jan 10–Feb 28 7:30–8:15 p.m. 110788 Wed Mar 7–Apr 25 7:30–8:15 p.m. Fees: $20(R) $28(N) (4 classes) 110789 Wed May 2–23 7:30–8:15 p.m. Boathouse Boot Camp (age 16 & up) Looking to get a challenging and effective workout in before the daily summer heat hits? Meet us at the Bond Park Boathouse for an early workout that combines cardio drills with muscle conditioning. Bring your own mat. Location: Bond Park Boathouse Deck Instructor: Laura Gnewuch Fees: $65(R) $85(N) (12 classes) 111014 Mon, Wed Apr 16–May 23 7–7:45 a.m. Body Sculpt (age 16 & up) Get your morning started with this energetic new program. Learn body sculpting exercises to tone and strengthen your muscles! Achieve a full body workout. Location: Bond Park Community Center Instructor: Judy Liu Fees: $40(R) $56(N) (8 classes) 110297 Thu Jan 11-Mar 1 9:30-10:30 a.m. Fees: $30(R) $42(N) (6 classes) 110298 Thu Mar 8-Apr 19 9:30-10:30 a.m. (no class Apr 5) Fees: $25(R) $35(N) (5 classes) 110303 Thu Apr 26-May 24 9:30-10:30 a.m.